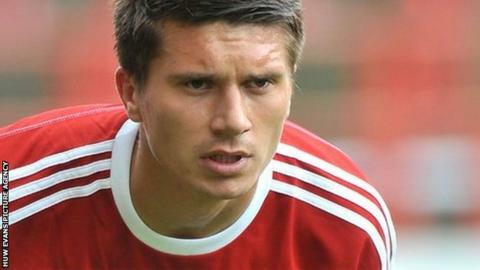 Adrian Cieslewicz is determined to seal Wrexham's first Wembley final by seeing off Gainsborough in the FA Trophy. The second, away leg of their semi-final is at Gainsborough next Saturday. "Wrexham have never been to Wembley... and I think you won't have a better opportunity than what we've got now," Cieslewicz said. "That'll be a massive thing, not just for me but for the club, for the fans." Wright gave Blue Square Bet Premier side Wrexham an early advantage over their lower league opponents but Darryn Stamp soon equalised with a powerful header. Cieslewicz's second-half introduction proved the turning point as his pace and penetration unsettled Gainsborough, allowing him to pounce on a mistake by left-back Danny Hone to restore Wrexham's lead. Then in added time at the Racecourse, Ashton's acrobatic finish put Wrexham in firm command of the tie against a side that has already beaten Conference Premier sides Forest Green, Barrow and Tamworth. "Them scoring to 1-1 set us back a little bit but the second goal was vital and then the third one gives us a little bit of an edge over them for the second leg," Cieslewicz added. "That gives us 2-0 at half-time and there's still the second leg to go. "But then again on Tuesday we've got Gateshead away [in the league] and that's the most important game at the moment." Wrexham's Conference Premier game away to Gateshead on Tuesday night will be played at Hartlepool United's Victoria Park Stadium because of continuing pitch problems at the International Stadium.